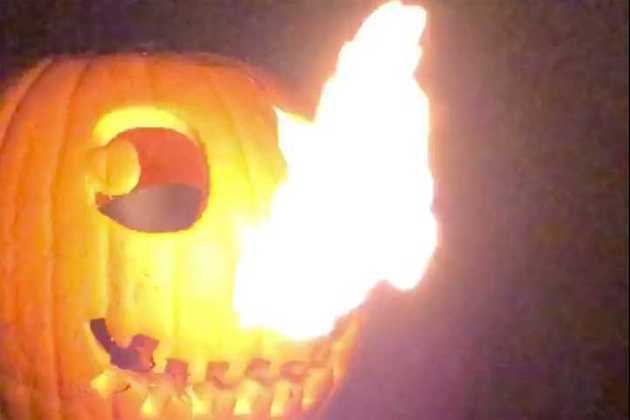 A flame-throwing jack-o'-lantern is a real Halloween highlight and definitely something to impress the trick-or-treaters and your neighbors. An internet controlled IoT flame throwing jack-o'-lantern is even better. This Jack-O-Lantern is internet connected and can be controlled via MQTT protocol. That way the project can be integrated into a home automation solution like OpenHab or Home Assistant to control the flamethrower from there or via Alexa or Google Home. You are "not so much" interested in Halloween? This is for you as well, a little fire will make even the most bold of people think twice about approaching your door. This is actually my second version of the flame-throwing jack-o'-lantern 😀 I already build one last year using a modified room spray (like this project). But these do not allow to control the flame directly so I decided I need to build a more pro version which allows controlling the duration of the flame. If you are going to rebuild this project you do it at your own risks. Read the warning above - twice! Also, make sure the place the pumpkin at a safe location to not harm anybody or burn down your own house! 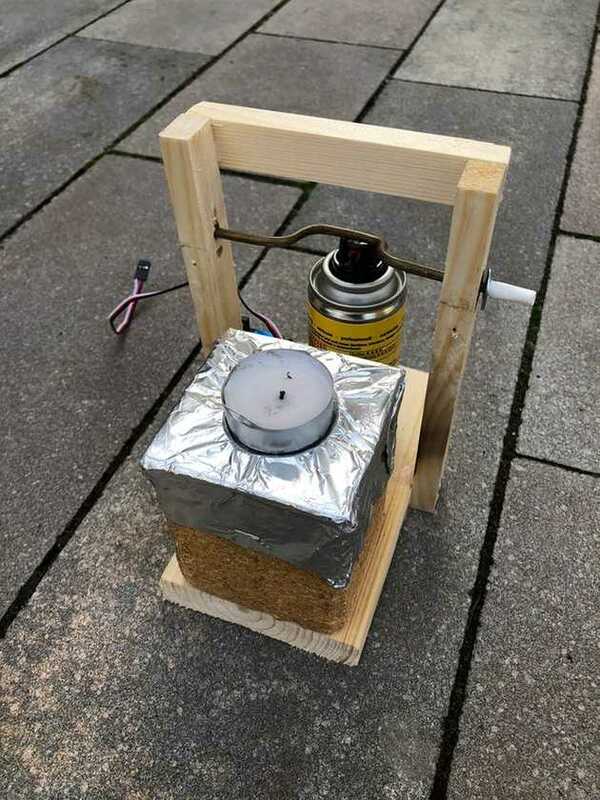 The display is not really needed for this project, it is just used for fun to display some little animation and information which of the motion sensors triggered the fire. As usual, I got the most parts from Aliexpress but all the parts should be available via other sources like ebay or amazon.com as well. The key element of this project is burning penetrating fluid which if sprayed directly into a candle burns like a small flamethrower. Place the flamethrower construction inside the pumpkin. Fix it with hot glue to stabilize it. 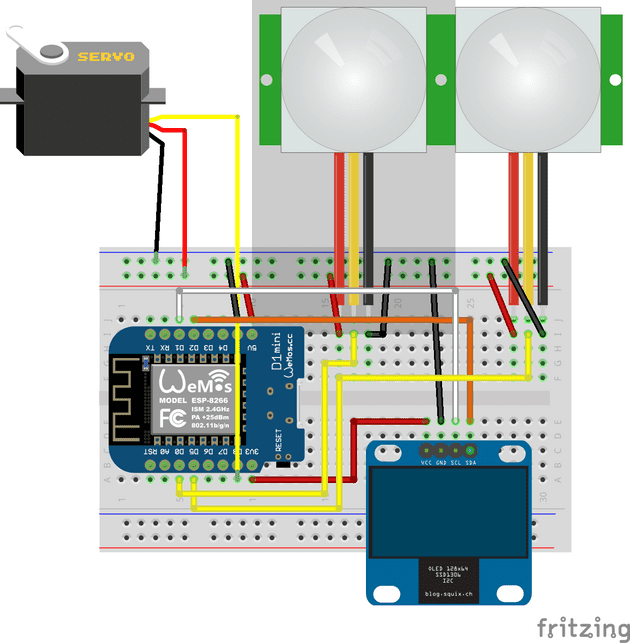 Connect the electronics with the servo motor wires. 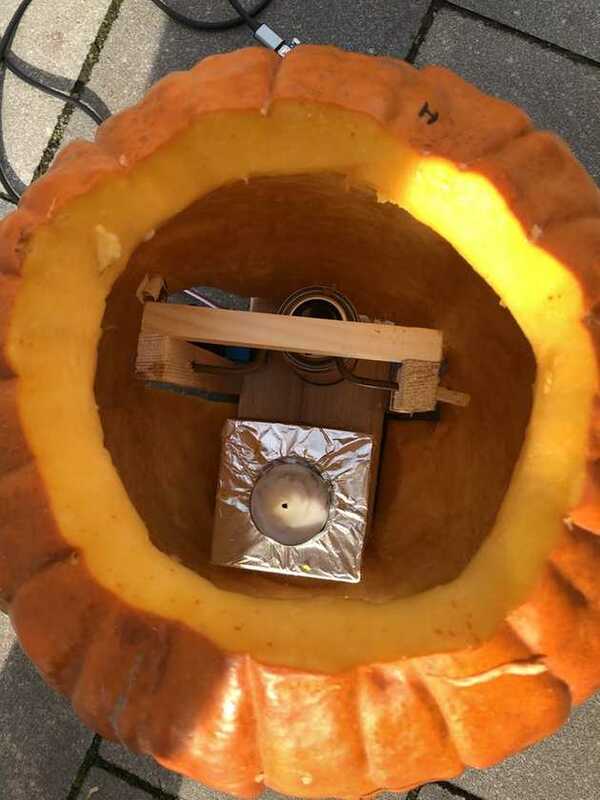 If enough space the electronics can be placed inside the pumpkin and the PIR sensors can be inside jack-o'-lanterns eyes. Make sure you have a sufficient distance between the electronic parts and the flame. 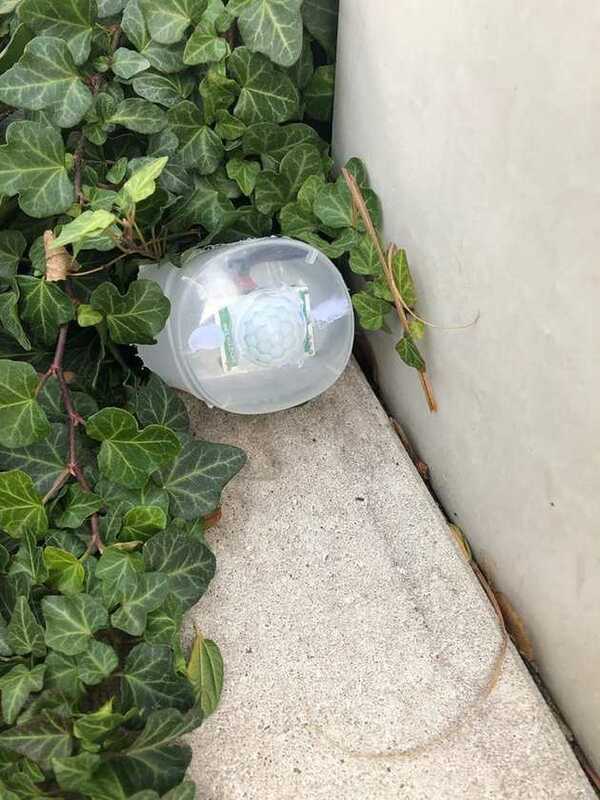 The PIR motions sensors got some protection cover and habe been places to recognize the movement of approaching trick-or-treaters. The software project for the ESP8288 board can be found in my GitHub repository. After uploading the software to the board it has to be configured to connect to WiFi and MQTT. Homie provides multiple ways to do this, I prefer to create and upload a config file. Alternatively, the configuration UI can be used. 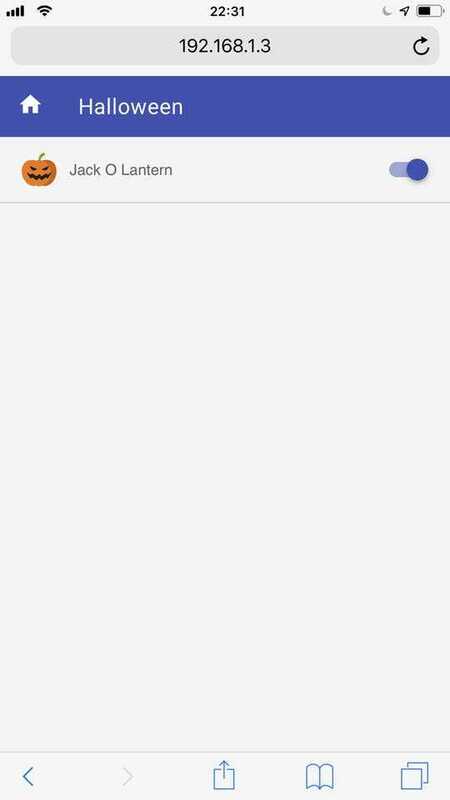 The code is written in C++, halloween.cpp is the main class. 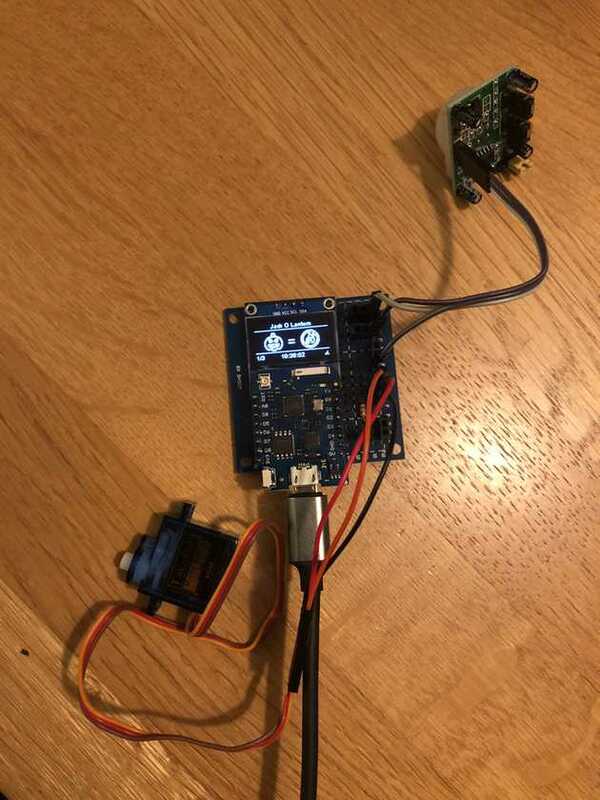 I used Homie to better modularize the software parts into dedicated "nodes" to control the servo, the display and get the PIR motion sensor inputs. Homie provides the MQTT protocol support, see Homie specification for details. The flamethrower supports one import command: switch on the fire 😀. It can be triggered via MQTT with homie/<device id>/fire/on/set with the value true.